We've been to Bohol last May 19, 2009. It was a very unforgettable moment for our family. 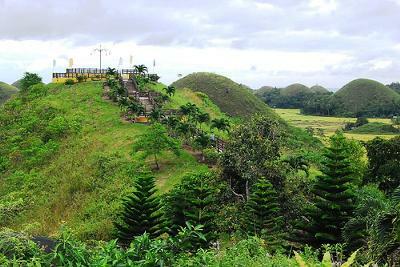 We went to Chocolate Hills located near the Sagbayan Peak, we also went to the Butterfly Garden it is located at the Sagbayan Peak, there were plenty of butterfly in the garden. We loved the view of the place and took pictures of it. We were able to visit the Baclayon Church, and took pictures of it. We watch the dolphins at the pangalao Island, but the dolphins can't jump higher because there were hight tide. We went to Bohol Beach Club, there were swiming pools for adult and kids, there were also a beach, were american and other foreigners swim. We went to Hinagdanan Cave, there were many bats in that cave. We rode a river cruise at the Luboc River, we saw foreigners swimming in the Luboc falls. We went to Municipality of Baclayon and took pictures. We went to Bohol Python, named Prony, the biggest snake in Bohol, was captured in October 21, 1996. Honestly, we were scared to touch the snake while taking a picture. I will never forget about the cute little tarsiers that we saw, it was different from other animals, because it is small and has a big eyes. It was very exciting in taking a vacation to Bohol. i am sure you will come back for more.